There's no one answer for what causes muscle soreness. Sorry, there's no easy answer. However, there are easy answers for specific kinds of muscle soreness. Basically, you get sore when some kind of damage is done to the muscle (when you're just starting to workout, this is common). You're soreness is based on what you did to your muscles. You bang your arm against the door going through. The next day your arm is slightly sore. This is the most common kind of muscle soreness. Bruises, broken bones, and other knocks fall into this category. Ways to prevent it? Don't knock into things and get bruises. Here's the really fun one. After you start a weight training program, you remember just how sore you can become! DOMS is caused by some kind of muscle damage caused by exercise, but what exactly it is about exercise muscle damage that causes DOMS is unclear. Basically, you do some kind of damage to the muscle and connective tissue which causes the inflammatory response of sore muscles a day or two after exercise. Further, delayed onset muscle soreness is associated with muscle damage, but there's no direct evidence for what the damage is that causes muscle soreness. So, paradoxically, getting yourself really sore in a workout may not do as much muscle damage as a workout that leaves you less sore. Confusing, but so far we must put our trust in the flighty temptress of science. Also, eccentric muscle contraction causes muscle soreness more than concentric exercise. There is some speculation about why this is, but it appears that the eccentric part of the muscle contraction is where the most force is exerted and, thus, there is the greatest potential for muscle damage. Eccentric contraction is when your muscle elongates under tension because some other force is more powerful than your muscle. An example would be the second half of a dumbbell bicep curl, where you lower the dumbbell and the bicep eccentrically contracts and elongates to straighten the arm as the weight lowers. If you are really averse to muscle soreness then try making a workout with only concentric contractions. This can be tricky (since you're only doing half of each exercise movement), but it can help you get less sore & eliminate one of the major causes of muscle soreness. Also, DOMS is not related to lactic acid. A myth that has been perpetuated over the last few years is that lactic acid is responsible for muscle soreness, while in fact it is flushed from your muscles about an hour after exercise. Fatigue that you feel after a sporting event is completely different from the soreness of DOMS. Trigger points cause dull, aching pain that does not go away simply because of rest. It can be mistake for DOMS, tennis elbow, and/or a variety of other chronic pain conditions. Trigger points are sections of highly contracted muscle that do not relax normally along with the rest of your muscle. This contraction of the sarcomeres (muscle cells) can be felt & causes muscle soreness; if you've ever massaged someone's neck and found one spot that's really tight and the 'right spot', you know what I'm talking about. If you're interested in trigger points, click on the link up top and check out more info on them. Inflammation is a biological protective response designed to help heal you. The process of Vasodilation causes increased blood flow, which is responsible for the heating of the inflamed area as well as its characteristic red color. There is also increased permeability of blood vessels, which results in the swelling of inflamed areas with fluid. Inflammation is the body's way of saying, "Hey, something's going wrong! Take it easy!" Delayed onset muscle soreness causes inflammation, and anything else that causes inflammation in your muscles will probably cause soreness as well. Flu causes some muscle soreness, and so does food poisoning. There are tons of other causes of muscle soreness out there in the world. Sorry. Thankfully, these are much less common than injury, delayed onset muscle soreness, trigger points, and various kinds of inflammation. 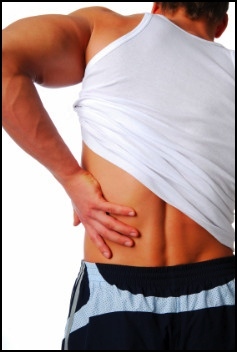 • Click here to leave 'What Causes Muscle Soreness? It's...' & go back to the Home-page! 1. Tiidus, Peter M. 2008. Skeletal Muscle Damage and Repair. Champaign, IL: Human Kinetics. Pp. 63. 4. Sharkey, Brian J., and Steven E. Gaskill. 2006. Sport Physiology For Coaches. Champaign, IL: Human Kinetics. Pp. 23.